Digital dentistry is no longer just the future of dentistry; it has become the present. We at Global Dental Solutions, LLC embrace technology and strive to keep up to date with the new technologies that improve our clinicians’ practices. If you’re a user of an IntraOral Scanner, or want to be, we’re equipped to service your needs and we’d like to be a part of your team. Read below to learn more, or give us a call. Are you a 3Shape TRIOS clinician? At Global Dental Solutions, we embrace evolving technology in the dental industry and strive to meet the needs of all our existing and potential customers. Accepting your digital impression file is no problem. Additionally, using a digital impression system doesn’t mean you’re confined to only milled restorations, such as zirconia. Using the model work we print from the digital file, we can fabricate any restoration type desired, from a standard PFM to a pressed and stacked e.max crown or bridge. We can also fabricate partials, dentures, and night guards using the printed model made from your scan. To send us files, log into your 3Shape Communicate account at us.3shapeCommunicate.com. From there, navigate to Connections, which is the 4th item on the menu bar in the header at top. The Connections tab is where all of your connections are managed. From there, click the Add Connection button at the bottom left. You will be prompted to “Fill in email of the Clinic or Lab you want to connect to.” Type digital@globaldentalsolutions.com into the field and click the Find button. Global Dental Solutions, LLC will appear in the Result field. Type your desired message to us in the “Message to Global Dental Solutions field” and click the Connect button. You’re now ready to send us files! Are you a Carestream clinician? We, at Global Dental Solutions, embrace evolving technology in the dental industry and strive to meet the needs of all our existing and potential customers. Accepting your digital impression file is no problem. Additionally, using a digital impression system doesn’t mean you’re confined to only milled restorations, such as zirconia. Using the modelwork we print from the digital file, we can fabricate any restoration type desired, from a standard PFM to a pressed and stacked e.max crown or bridge. We can also fabricate partials, dentures, and nightguards using the printed model made from your scan. You can add us to your software at the time you want to send a case. After you import the case, on the right side of the screen you will see the “Choose a Laboratory” tab. In the “Email” field, please enter digital@globaldentalsolutions.com and select the okay button. After you select okay, the next step is to fill out the RX notes, attach extra files if needed, and select the submit button. Once the submit button is selected, the invite message window will pop up and you will be prompted to send an invitation message. Customize your message as desired, then select okay, and we will be sent an invitation to accept your request. Upon our acceptance, the digital scan file will be submitted to us for case manufacture. Are you a Cadent/Aligntech iTero clinician? At Global Dental Solutions, we embrace evolving technology in the dental industry and strive to meet the needs of all our existing and potential customers. Accepting your digital impression file is no problem. Additionally, using a digital impression system doesn’t mean you’re confined to only milled restorations, such as zirconia. Using the model work fabricated from the digital scan file by Cadent/Aligntech, we can fabricate any restoration type desired, from a standard PFM to a pressed and stacked e.max crown or bridge. We can also fabricate partials, dentures, and night guards using the printed model made from your scan. 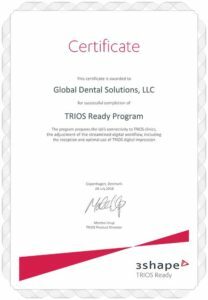 To send us files, simply call (800) 577-8767 and request from customer support that Global Dental Solutions, LLC (iTero ID #5698) be added to your account. When you select the Ship To option on the Rx page, there is a scroll-down menu that lists the labs that you have requested be added to your account. From there, select our laboratory to send us the case. Are you a Sirona Cerec Connect clinician? We, at Global Dental Solutions, embrace evolving technology in the dental industry and strive to meet the needs of all our existing and potential customers. Accepting your digital impression file is no problem. Additionally, using a digital impression system doesn’t mean you’re confined to only milled restorations, such as zirconia. Using model work we print from the digital scan file, we can fabricate any restoration type desired, from a standard PFM to a pressed and stacked e.max crown or bridge. We can also fabricate partials, dentures, and night guards using the printed model made from your scan. Scroll to see more or call 844-521-9829. To send us files, log into www.cerec-connect.com with your username and password and go to “My Account.” From there, go down to “My Favorite Labs” and, when selected, a box appears that allows you to click “Add new laboratory to list of favorites.” Once selected, it opens up a new box to perform a keyword search using the lab name (or part of the lab name) or a zip code search. Enter Global Dental Solutions to search by name, or, to search by zip code, enter 30350 and leave the distance field blank, then click the “find” button. Once we appear, check the box beside our laboratory name and click “Add.” From there, we’re now in the favorite labs list and you can select us for the next intraoral scan. Are you a 3M clinician? We embrace evolving technology in the dental industry and strive to meet the needs of all our existing and potential customers. Accepting your digital impression file is no problem. Additionally, using a digital impression system doesn’t mean you’re confined to only milled restorations, such as zirconia. Using the model work we print from the digital file, we can fabricate any restoration type desired, from a standard PFM to a pressed and stacked e.max crown or bridge. We can also fabricate partials, dentures, and night guards using the printed model made from your scan. To send us files, please call 3M at (800) 634-2249 and select option 3, then option 1. The customer care representative will ask for our lab name and for you to confirm that our street address is 8215 Roswell Road and our state is Georgia. He or she will then set us up in your account and will review with you how to activate us prior to sending the first case. We are a DDX-Enabled laboratory. Any Dentrix user can submit digital cases to our laboratory using DDX. Use it for prescription forms, photos, and/or digital impression files, which are submitted instantly over a secure electronic connection. Eliminate the errors and omissions that often accompany handwritten lab prescriptions. Save time and effort with an efficient “Quick Case” electronic form that allows you to submit basic casework quickly—or use more advanced tools and forms for more specialized cases. Streamline the submission process by uploading digital case files from DDX directly to us. This automated process ties any digital file directly to your case, and is much more efficient and less error-prone than mailing a physical disk, sending files in a separate email, or manually uploading files to an FTP site. The steps you as clinician would follow for adding us into your DDX software are simple: All you have to do is go to “Add a Lab,” type in Global Dental Solutions, and click “Add” and you are now ready to send your case work for superior results. Click here to be taken to the DDX login page and send us a case.